Lophostemon confertus ‘Brisbane Box’or ‘Brush Box’ will grow to 15m and used widely as a street tree especially in Melbourne. Readily available for sale in a range of sizes from participating wholesale growers. Forming a single leader Lophostemon confertus forms a nice rounded head and requires little watering after establishment except in drought years and in areas with very poor soils. The white flowers in summer are attractive as they are set against the darker green foliage, and bees seem to like them. Lophostemon confertus is a fast growing tree that requires little care once established, well suited to street and parkland plantings and useful as a specimen tree or large screen in larger gardens. Brush Box is widely for timber production as well as for street trees. Naturally occurring in coastal areas from Queensland to NSW, Brush Box will reach 10 – 15 m and is relatively drought tolerant once established. Brush Box grows well in a fertile free draining soil in full sun. Widely used as a street tree, well suited to parks, gardens and around commercial and industrial developments. 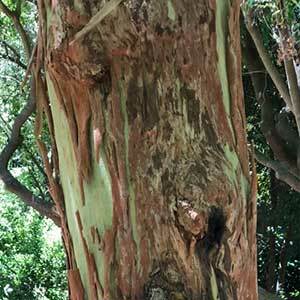 Very attractive bark is an added attraction, a good shiny bronze to brown. Common Names – Brisbane Brush Box and Queensland Brush Box. Spread – Crown or around 6 m with a dome like appearance. Soil – Well drained sandy loam to open clay, will tolerate poorer soils. Foliage – Mid to deep green and glossy. Growth Rate – Moderate to fast. Uses – Shade tree, Street Tree, Bird and bee attracting, wind break tree or feature tree. Lophostemon confertus is available for sale from the following wholesale nurseries.